Canadarm2 is regularly used for spacewalks and for capturing cargo spacecraft. LONGUEUIL, Quebec — I'm just inches away from capturing a Japanese HTV cargo spacecraft on the International Space Station using the Canadarm2 robotic arm. But things are getting dicey. My hands keep shaking on the controls. Three displays in front of me show where the HTV is in relation to Canadarm2: I can see the target in front of me, but the green crosshairs on my screen keep jumping past the target I need to hit. "You need to keep accelerating smoothly," urges Jeremy Hansen, a Canadian Space Agency astronaut. He tells me to move my hand up by just a few millimeters. I focus. The swaying decreases. I'm still a little off target when Hansen tells me to hit "capture" on the joystick, but the arm is smarter than me and locks into place. My few moments at a Canadian Space Agency& (CSA) simulator Thursday (Sept. 6) showed me just how sensitive the Canadarm2 is when real astronauts operate it in space. You only need to touch the controls with the lightest pressure and the arm responds; it feels less like driving a car and more like executing a complicated move in the video game "Mortal Kombat." As part of their regular training schedule, astronauts all over the world come here — to a suburb just outside of Montreal — to take their turn at the controls. But for them, the training is much more rigorous than for a visiting space reporter: Perhaps a spacecraft will fail in the simulation, requiring the astronaut to simulate an abort and move the spacecraft 50 miles (80 kilometers) away from the space station to figure out what to do next. Or, maybe the Canadarm2 will lock up due to a software or mechanical failure. Even Hansen himself had an unexpected thing happen during a media demonstration of the simulator. He, of course, put the arm through its motions flawlessly until just a moment before capture. At that point, the circular wires on the end of Canadarm2 are supposed to close in on the spacecraft, but for whatever reason, the sim wasn't listening to Hansen's command. "Let's reboot the sim," he said calmly to the assisting simulator specialist. In real training, he told me later, the astronauts would not just walk away from the situation. Instead, they would work through the problem using instructions; to cue astronauts, the steps to addressing problems are written in small letters on three cue cards pinned just underneath the simulator screens. Canadian astronaut Jeremy Hansen demonstrates the Canadarm2 simulator to a young girl at the Canadian Space Agency headquarters near Montreal. Canada's largest contribution to the space station program is in robotics, which gives the country the chance to send up astronauts and experiments every so often. The last astronaut to fly was Chris Hadfield in 2012 to 2013, and the next one will be David Saint-Jacques in December. The CSA offered the tour on the same day that Saint-Jacques participated in a press conference in Houston — the last public event before his scheduled flight on Dec. 19. CSA officials have said Saint-Jacques may operate the Canadarm2 himself while he is in space. Canadarm2 has been on the space station since 2001, playing a role in dozens of spacewalks and space station repairs. That's what Canadarm2 was designed to do, but it also regularly performs a function that engineers didn't originally envision. Several robotic spacecraft cannot dock with the space station, such as HTV or SpaceX's Dragon. So Canadarm2 snags the spacecraft while it is close to the station, free floating in space, in a procedure called berthing. On the same day as the tour, controllers were preparing the real-life arm to capture the Japanese HTV spacecraft that is scheduled to launch to the space station soon. "We're busier now than we've ever been," said Ken Podwalski, the director for Canada's ISS program, during a tour of the robotics facilities here at CSA. "We're doing more and more things that we didn't conceive of as being robotic operations." He added that at 17 years old, the mobile servicing system (which includes Canadarm2) has required a few repairs. In the past year, both ends of Canadarm2 were replaced, but Podwalski added it was done in such a way that ordinary space station robotic activities were not disrupted. Other Canadian contributions to the space station include Dextre, a robotic manipulator "hand" that is operated remotely here at CSA; and Canadarm, a robotic arm that was used during the space shuttle program. Canada also contributed a long boom that was used to scan the shuttle's belly for missing tiles. 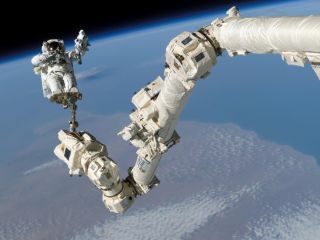 Canadian robotics company MDA is the prime contractor for such Canadian robotics equipment; the original Canadarm was manufactured by a former company called Spar Aerospace, which MDA later bought out.